CK Power provides marine power generation solutions for both working and pleasure watercraft. Whether you’re a first-time buyer or a marine supplier with your service reputation on the line, we have the experience to help you get the job done quickly and correctly. From push boats to speedboats, tugboats to luxury yachts, our marine diesel generators and engine systems are among the most dependable on the water. Because our customers expect the best products on the market, our marine generator offerings include lines powered by Kubota and John Deere. And, as always, working with CK Power means you’re getting more than just an engine supplier. We work with marine dealers on mounting assistance, maintenance and repair. This means our customers get not only our outstanding marine power generation products but also access to unparalleled service, support and parts network. Having an experienced marine generator supplier means less downtime for those who make their living on the water. 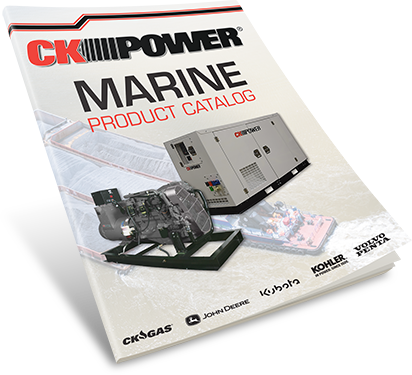 To make CK Power your source for marine power generation, get in touch with us today.